About PA Snakes: Most snakes are not venomous. However, if you are ever unsure about the species of snake that you see, you should leave it alone. 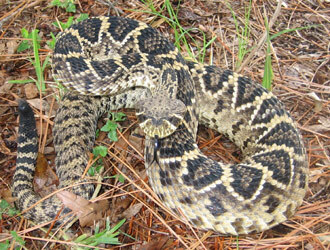 Pennsylvania does host several species of venomous snakes. Most bites occur when people try to catch or handle these reptiles. We have professional snake handling equipment that makes the removal of unwanted snakes both outside and inside the home safe. Snakes are a common nuisance reptile in southeast Pennsylvania. In Philadelphia and Montgomery County, snakes have become a particularly common problem, as they have invaded many properties in the area. If you need a professional solution for your Philadelphia snake problem, give us at A Wildlife Pro a call. Philadelphia Wildlife Pest Control - Learn about all of our services, and more about our animal control company.